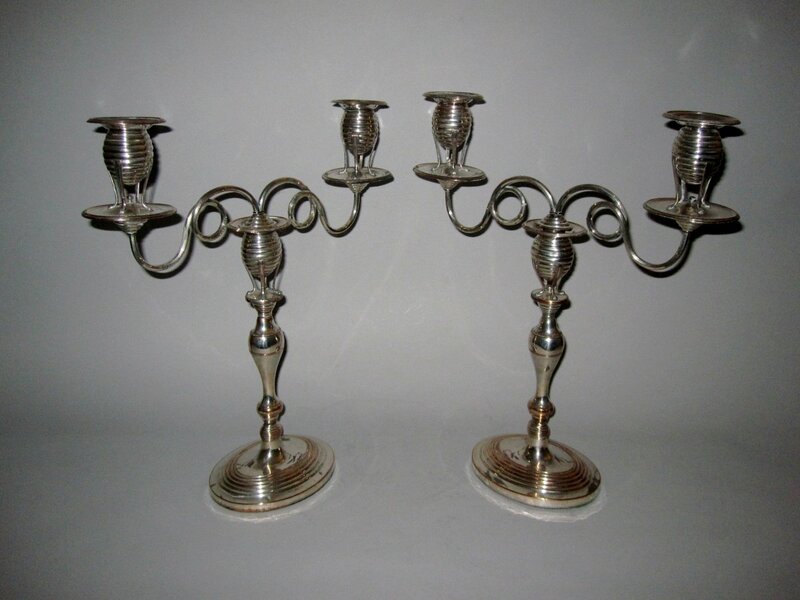 A PAIR OF OLD SHEFFIELD PLAE SILVER "BEEHIVE" TWO LIGHT CANDELABRA. GEORGE III, CIRCA 1795. PROBABLY BY ROBERTS CADMAN & CO.
Of a very unusual design. Each with baluster form stems with a beehive capital (supported on four legs with paw feet), with two scroll arms each supporting a beehive capital, on a raised and stepped oval foot with reeded borders. For a similar example, see Crosskey, G., Old Sheffield Plate, Treffry Publishing, 2011, figure 429, page 308.